Born in 1960, Anderson grew up in Burnaby, British Columbia with another future star who would one day grab headlines, actor Michael J. Fox. Anderson was an active kid but didn't immediately warm to hockey. "When I first started playing hockey, I hated it. I hated getting up at six o'clock in the morning to go to the rink," Anderson said. "I skated with my ankles turned in and everybody else skated the other way. The first goal I ever scored was in my own net." 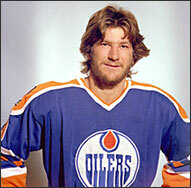 Anderson was selected 69th by the Edmonton Oilers in the draft of 1979. His objective, however, was not the NHL but the Olympics. He dreamed of gold medals, and he preferred to use his developing skills in the sport as a key to seeing the world. He joined the Canadian national team and travelled with the team throughout Europe and Asia to prepare for the 1980 Winter Olympics at Lake Placid, New York. Anderson had four points in six contests at the Games, but he and the Canadian team were forced to watch the thrilling final, the Miracle on Ice for the Americans, from the stands. 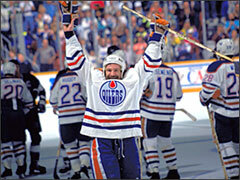 Glenn Anderson tallied nine 30-goal seasons as an Oiler and contributed to an offensively stacked line-up which captured the Stanley Cup five times from 1984-1990. Unlike many of national team members, Anderson didn't immediately rush to join a big league squad. He returned to junior hoping the Canadian program would continue, allowing him to travel and play the game as he had the previous year. When it didn't, Anderson finally joined the Oilers for 58 games of the 1980-81 season. He scored 30 goals, an excellent start for a rookie, and further announced himself with 105 points the next season to finish among the top ten scorers in the league. Anderson's Edmonton teammates called him "Mork," a reference to the television series "Mork and Mindy" starring Robin Williams. Anderson disliked the name, though his actions and personality did set him apart from the crowd. On one trip to Europe he brought all of his hockey equipment but decided that the clothes he had on would be enough. On an exhibition trip to Houston, the Oilers were given a tour of NASA. "I can relate to outer space," Anderson told a reporter. "I've been there before. In fact, I think it would be closer to home." As an Edmonton Oiler Anderson recorded three 100 point plus seasons and played in four NHL All-Star Games (1984, 1985, 1986, 1988). Anderson launched himself at the net on rushes, using his balance to stay upright even with defenders hanging from him. He was consistently near the top of the NHL in scoring and thrived in the playoffs, scoring overtime winners and game-clinching goals in each of the Oilers five marches to the Stanley Cup between 1984 and 1990. Anderson's play remained steady on the ice and he had 22 points in 22 playoff games when the Oilers won the Cup in 1990. Two years later he was involved in a blockbuster trade that saw some of the last pieces of the Oiler dynasty, himself and goalie Grant Fuhr, moved to the Toronto Maple Leafs. 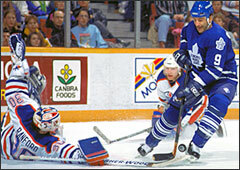 Anderson became one of the Leafs top scorers and once again was a playoff leader as Toronto made it to within one game of the Cup finals in 1993. In the middle of the 1993-94 season, Anderson asked the Maple Leaf organization for permission to play in the 1994 Lillehammer Olympics. He had negotiated the option to play for Canada into his contract and the Leafs agreed to take his case to the NHL, which usually did not allow players with more than one year of experience to play in the Games. Anderson was turned down by Commissioner Gary Bettman, who argued with the politician in front of television cameras after announcing his decision. 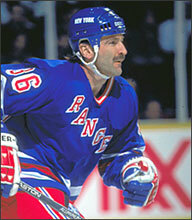 Anderson was traded to the New York Rangers for Mike Gartner just before the 1994 playoffs. He joined Mark Messier and other ex-Oilers in winning the Stanley Cup in those playoffs. Of his three goals, two were game winners. At the time, only Maurice Richard had more overtime playoff goals, and only Messier, Gretzky, and Jari Kurri had more playoff points. Anderson's approach to the sport was ideologically different than that of many of his peers. More European in outlook, he never missed a chance to play in international competitions. He did suit up for over sixty games over two years, from 1994 through 1996, with the St. Louis Blues and Edmonton Oilers, but in each instance he left quickly. After playing in the 1980 Olympics and the World Championships in 89' and 92', Anderson ended his career in Europe, playing in Germany, Finland, Italy and Switzerland before retiring. 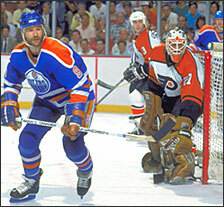 Throughout his NHL career, Glenn Anderson played over 1,000 games scoring 498 goals and 1,099 points.